General. Hellesylt is a small village that, just as many other settlements in the country, emerged at the end (or the beginning if you prefer) of a fjord. This is the spot where land descends into the Sunnylvsfjord. The view from the village on the fjord and the snowcovered mountain peaks is simply breathtaking. 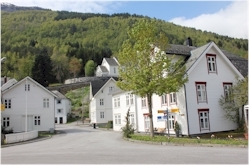 The settlement that is part of the community of Stranda, is absent in most travel guides which makes that it is very quiet here and the center with its typical wooden houses maintained its authenticity. There is quite a lot to see and to do in the immediate surroundings: the famous Geirangerfjord is almost litterally around the corner just as the Sunnmore Alps with their ski resorts. 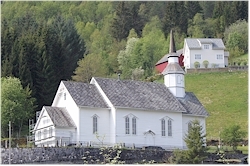 The village itself is quite nice too: the white church is located on a small elevation and looks out over the village as were it its protector. At the side of harbor, the water of the Hellesyltfossen flows incessantly with great force in the fjord. Monuments. You will not find a lot of monuments here but the small church (Sunnylven Kirke) is a beautiful modest building. It is a white, wooden prayer house dating back to the middle of the 19th century. The Grand Hotel, located at the ferry terminal really stands out. Its architecture reminds you of the time that travelling was reserved for the happy few. Nature. The Sunnylvsfjord is the real eye-catcher of the village; it's obviously hard to miss it. The wide waterway is confined by steep mountains with peaks that are covered with snow for the largest part of the year. 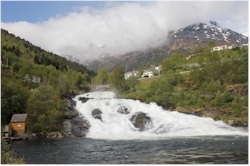 The melting water ejects into the fjord through several waterfalls. It almost has something mythical; seeing all that beauty it should be no surprise that Norway is called the country of legends and sagas. The Sunnylvsfjord is a branch of the Storfjord. 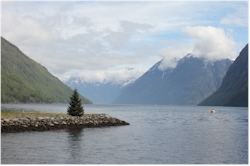 The magical Geirangerfjord in turn is a branch of the Sunnylvsfjord. The mouth of the Geirangerfjord can be seen from the village and the ferry takes you there in merely a quarter of an hour. On the road to/from Stranda just outside Hellesylt there is a viewpoint from where you have an exceptional view on the mouth of the Geirangerfjord. The Sunnmore Alps are not only beautiful to look at, they are also very interesting for an active vacation. In winter they are ideal for skiing or cross-country skiing, in summer they are popular for hiking. There are various walking trails in different categories. The waterfall called the Hellesyltfossen that roars through the village is the cherry on the cake. Peer Gynt Galleriet. 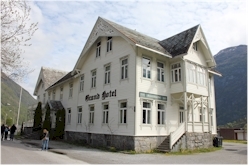 If you are thirsty for a bit of culture, then you can have a look in the Peer Gynt museum. This is a small gallery about the life and work of Henrik Ibsen for which the famous Norvegian composer Edvard Grieg wrote the music. How to reach Hellesylt? By car via the road between Stranda and Stryn (nr 60); there are bus connections with the surrounding settlements (also from Alesund). If you are using your own transport, take into account that not all roads are free during the winter months. Please check the road conditions before you leave to avoid unpleasant surprises. By ferry you can get here from Geiranger.